In addition to rescuing and rehoming farmed animals, Cedar Row has created and fostered friendships between animals that wouldn’t normally seem possible. Pigs hanging around with dogs, turkeys resting on goats, cats babysitting baby pigs, inseparable geese and ducks…. The list goes on. Animals show signs of stress, they grieve, they express joy and they love. 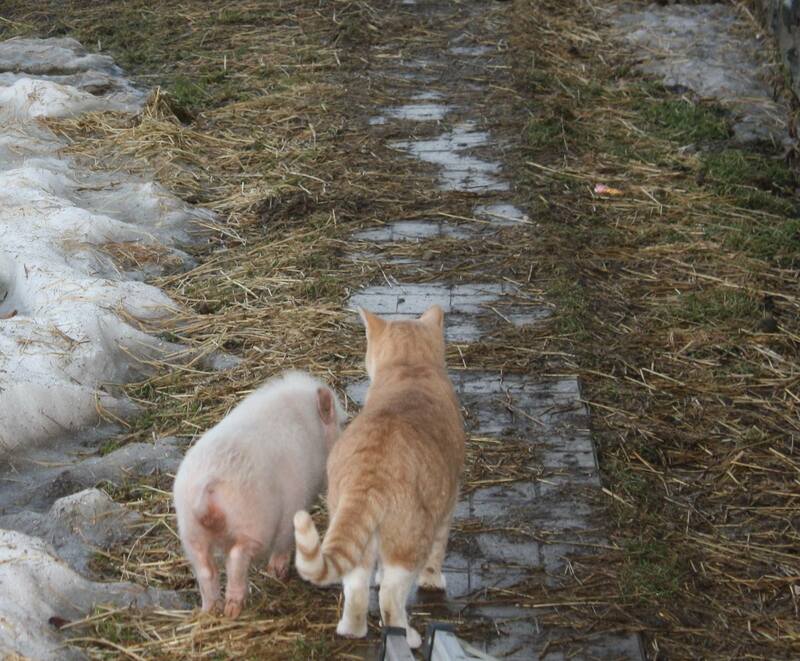 One of our cats, Herb, takes a special interest in baby pigs that make their way to Cedar Row especially when they’re adjusting to their new surroundings. He spends time with them, sleeps in straw with them and shows them the ropes around the sanctuary. It’s a bond that wasn’t expected but one that show the compassion that animals have for each other. Midas, the Great Dane, has a similar interest in new arrivals. This past winter he has busied himself by playing and accompanying Darcy and Penny around the farm, never more than a few feet from them when they’re exploring. If you’d like to meet our animal friends at Cedar Row, sign up for one of our work visits here or come to our Summer of Peace Open House on July 9th!